Love this inspiring collection of first-person true stories celebrating courageous Holocaust survivors and rescuers from all over Europe! Someone lent me copy of THE COURAGE TO CARE, knowing I am interested in the Holocaust. 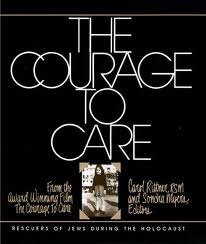 This book exceeded any and all expectations I had.THE COURAGE TO CARE is a collection of testimonies from survivors of the Holocaust who hid and those amazing individuals who risked their lives to help save Jews and others who were being hunted by the Nazis. For the Jews, they faced death simply because of the religion they were born into, whether they practiced the faith or not. First there was discrimination and the start of dehumanization. Then came the segregation, first with them having to wear the Star of David on clothing, then the Ghettos, and finally the camps, all the while mass murders were happening. Many accepted what was happening. Some rebelled, others fled. Then there were those who chose to go into hiding.The testimonies from the survivors are each so unbelievably unique and moving. One survivor tells of how he once spent a night hiding inside a church organ. Another referred to the gentleman who saved her, and approximately 300 other Jews, as being “like Moses watching over his people”. One survivor not only recounts his experience, but the events that happened in a small village where the Nazis feared explosives. They took the men and shot them. Then they locked all the women and children in the church, locked the doors and set it on fire. There was only one survivor. An entire village eradicated. The rescuers stories are equally unique. There are many forms of rescuers’, those who hid people and those who helped in a vast number of little ways. Simple things we wouldn’t think about today saved lives. A town elder once told two Nazis he knew a young man and his family when they were about to arrest the young man for not having papers. The young man was a Jew on the run. This town elder had never seen the young man before. Perhaps one of my favorite rescuer testimonies was from a young woman who worked in a factory in Poland. In this factory, she served the Nazis and became friends with a group of Jewish people from the ghetto who also worked there. When it came time for the Jews to be deported to a camp, they asked this young woman for help. They asked her to hide them. No sooner had they asked did the young woman get a job as housekeeper and cook to one of the high ranking Nazi officers. She took this group of Jews and hid them in the kitchen of the Nazi officers house, always leaving the door locked. One day, in shock, she forgot to lock the kitchen door and the officer walked in on her and the Jews. He didn’t report her or kick them out because he did not want to hurt the young woman or send her to her death. For the rest of the war, this high ranking officer hid a group of Jews in his home!I really could go on and on about this book. However, I feel between this and my video review (https://youtu.be/cMHH17JZZbw), I have said more than enough. I would highly recommend THE COURAGE TO CARE to anyone! Seriously. To anyone. It’s a phenominal book, full of different experiences, emotions, and unique testimonials from a diverse group of people. Go out and find a copy! This book was divided into two parts: the first half told the story of a group of Jewish children who were rescued from concentration camps, orphanages, or from families who (because of the war) simply did not have the means to support them. This group of about 20 are cared for in a home in Britain, run by a woman who did her best to provide stability and a sense of family to them. The second half of the book visits many of the children years later, to see how they have managed, and if they have been able to overcome their traumatic childhood experiences.Not an easy book to read because of the way it was written (thus the 4 stars), and because in some ways the project seems distastefully like a scientific experiment. However, I did want to know if the children were able to heal, and how they were able to live on in spite of the fact that they had had no real experience of home and family life and the unconditional love of a parent. The answer was interesting, and I will leave it to you to find that out for yourself.A few things stood out to me: *How often the smallest kindness from a stranger changed the course of an individual`s life. How in the absence of a parent, anyone who showed kindness and took the time to teach a skill to one of the children became a pivotal example that the child would cling to - just as even a small betrayal proved devastating. *A lot of the individuals owned dogs - German Shepherds, specifically. An incredible thing if you consider the description in the first half of the book of how the children on first arrival would cower in fear, or run and hide if they heard a dog barking (they associated dogs with German soldiers). I thought this was remarkable - maybe a way of healing, to be able to see an animal which is a symbol of everything you fear most, as innocent, and even as a friend. To me, this showed again how so often people who have difficulties trusting and relating to other human beings find consolation in animal companions who show them friendship, acceptance and affection without betrayal. That they would choose German Shepherds seemed a deliberate decision to face their fear and live in peace with it. Very moving.The stories of the adults really impacted me. The fact that a stranger`s kindness could mean so much made me realize I need to make the most of every opportunity to be kind to strangers (and friends, of course). This quote really hit me (pg. 145)``By their fruits you shall know them``(Matt.7:16)is an awesome and yet justifiable criterion for testing the authenticity of any religious claim. We are to be judged by the quality of our actions rather than the quantity of our affirmations, by the immediacy of what we do rather than by the intensity of what we say.``Robert McAfee Brown A book to make you think. Another book I picked up on rescuers of Jews (see my review for The Hand of Compassion: Portraits of Moral Choice During the Holocaust for the first I skimmed). I feel a little bad for not finishing these books, because they provide such fascinating looks into some of the most evil and, more particularly, the most profoundly good parts, of humanity. The stories in this book are in narrative form (compared to the transcript form in The Hand of Compassion) and quicker to read. You don't always get the depth of emotion that you get from the transcripts in The Hand, but you definitely get the same illuminating picture. A "lighter" read, if books about the Holocaust can be considered such. By far, one of the most moving books I have ever read. Although the Holocaust will always be one of the most horrific events to ever occur in the 20th century, this book supports the fact that, in the face of so much evil, good people do exist, and did so at the risk of losing their own lives in order to save the lives of others. I cannot recommend this book highly enough. Definitely worth putting on your reading list. First person accounts of rescuers and survivors of Nazi persecution, with photos of the people, hiding places, documents, and communities to supplement the text.I would use this as part of everyday warm ups where students would have time to read a small portion and then answer a daily question. I was so moved by the stories in this book. When most of the world did nothing, there were those few who saw the injustices around them and had the courage to risk everything to help those in desperate need. This book reminds us what humanity is and the moral choices we can make. Rescuers interviewed. The book accompanies the film, which came first. Both book and film are excellent research. Interesting to see a different array of people from different countries in Europe, that did rescue for their Jewish neighbors.